It's not unusual to find Jose Guzman in and around the Gordon Field House playing tennis or supporting recreational activities and special events. Amidst hundreds of guests dressed in formal attire, it wasn’t hard to pick out Jose Guzman. Look there, up on stage. That’s him dancing—in a tiger costume. Due to several circumstances, not the least of which being Guzman’s outgoing personality, he was asked to play the part of RIT’s mascot, Ritchie, during the 2007 retirement gala tribute for President Emeritus Al Simone and his wife Carolie. “That was awesome,” remarks Guzman with a big smile. “I walked in with Dr. Simone and everyone was really happy and excited. It was really cool because I was saying ‘hi’ to people but they had no idea who I really was.” In or out of costume, it’s hard to miss Guzman’s zest for the opportunities he enjoys at RIT. A fifth-year computer engineering major in the Kate Gleason College of Engineering, the Guatemala native is making his mark on campus in a variety of areas that include academics, athletics and organizational leadership. Arriving on campus in 2005, Guzman quickly realized the need for balance. He bonded with new friends, “people from all over the world,” he points out, and he made time to take part in campus events and other social activities. He also indulged his passion for sports. “What helped me stay really busy was tennis. It takes a lot of time, but it got me really organized and into a routine, which I think was really helpful.” Guzman has played four consecutive seasons on RIT’s tennis team. He recently earned first-team conference honors, leading the team in 2009 to its most successful season in several years. In conjunction with tennis, Guzman is a member of the Student Advisory Athletic Committee, in which he served as the representative to Student Government this past year. And even when he’s not practicing on the indoor tennis courts, it’s common to find him somewhere else inside the Gordon Field House and Activities Center or Student Life Center, serving as a student employee supporting recreational activities and special events. “Jose is always willing to help those around him in the work setting and on the proverbial playing field,” says David Stevens, recreational services manager. “It is truly my honor to meet and work alongside such a tremendous young man.” Enhancing his career prospects, Guzman recently completed a co-op with iSeerix. The locally based consulting services company specializes in computer software design and analysis, and it offered him an opportunity to make an immediate impact. “From scratch, as a co-op, I started designing a software program, which now is almost in its first release.” And as Guzman looks toward graduation, he’s excited about exploring new opportunities, including the possibility of graduate school. 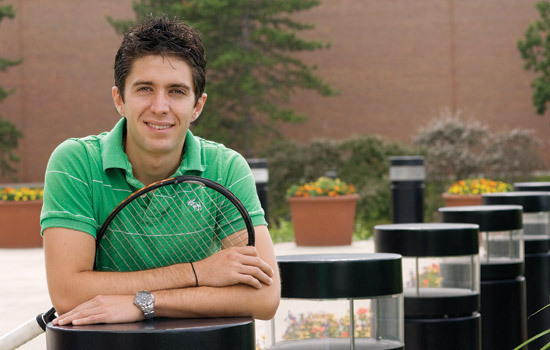 If his undergraduate experience is any indication, he is destined to make the most of it. “Nobody told me to do tennis or to do Student Government. The opportunity to do more is what I will take away most from this whole experience. You really have to explore and be part of things to really make it your own.” Guzman, as Ritchie, greets President Emeritus Albert Simone in 2007.